Several years ago I reported that my average electricity usage in the non-summer months was a meager 4 KW-hr per day—not bad at all for a 2,500-square foot home. In the last couple years, my energy use has been higher: as much as 5-6 KW-hr/day. What happened? Well, I acquired some kittens. While they rarely flip any light switches or turn on any energy-sucking electronic equipment, they do have a water fountain that runs 24 hours a day, although I don’t imagine that uses more than, oh, 20 watts. A bigger heavy-hitter was a dual-CPU high-powered HP workstation, replete with four fans and a relatively speedy graphics chip. 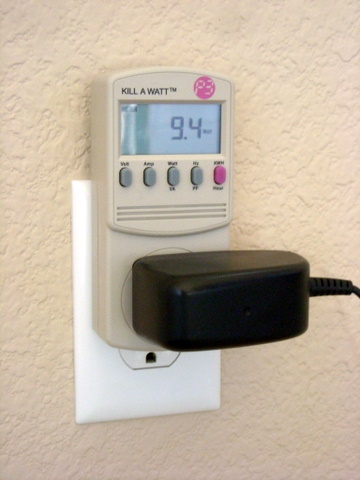 I wondered how much energy this actually used so I purchased a Kill-A-Watt power-measuring device (~$20). The verdict: the computer uses up to 222 watts! Unfortunately, I never did get around to measuring the power consumption of the kitty water fountain, and I have since resold the Kill-A-Watt device. But it looks like I can’t really blame my two furry housemates too much for the increased energy usage, too bad. Between November-December, we averaged 15.4KW-Hr/day. Biggest energy drain remains the pool filter. Current-era laptops are as powerful and speedy as desktop computers from a few years ago. No doubt I could lower our energy usage down further by retiring the Mac Pro with a new Mac Book Pro (but it’s not going to happen until next year at the earliest). What about your gas usage? I expect that to be higher given the temperature difference between Fort Collins and the Bay Area. Hi Adam. Looking at my gas bill, my gas usage ranges from 5 Therms (July, August, September, October) to as much as 124 Therms (December, January, February). I’m not sure if that is good or not, but if I was motivated I could cut back more. Been using more gas recently than in previous years due to having guests/girlfriend over more often, and so I frequently have the thermostat set at 68-70 degrees instead of my usual 59-64. What is your gas usage? Averaged below 14 therms/month for the entire year, but we rarely ever turn on the heat in the house (this month will be the exception). I recall that you have a gas range in the kitchen? Ours is electric, so our gas usage is really just for the house and water. Wow, that is really good Adam! That’s amazing you have only had to turn on the heat one month of the year! Looks like my average gas usage for 2011 was 54 Therms/month. That’s almost 4X more than yours! I use gas for cooking but it can’t be much since the months I use gas for only cooking and the hot water heater is 5 Therms/month. Heat is definitely the heavy hitter that I could optimize more. I’m going to see what I can do to insulate the house a little more. I know at the very least I could seal the front door a bit better. Our house just has wall heaters, not central air. Don’t know if that changes things. We’ll probably be using the heater a little more this coming year, since we don’t always want to be freezing in our own house (we typically wear lots of clothes in the winter months). How do wall heaters work? My home has central air. “We typically wear lots of clothes in the winter months” — reminds me of my first year in the house, and I was really into conservation. I’d wear a fleece jacket, wool hat, and even gloves inside the house (thin ones so I could type). Wonder what my gas usage was like back then. Wall heaters has gas hookups but the heat isn’t circulated through the house through ducts like with central air. The heat just pumps out of the wall… eventually, it gets around the house (or the room that you’re in). There are two wall heaters in the house. One in the living room and the other in the hallway to the bedrooms. That sounds efficient—heating through radiation instead of convection.